The full prices and positions for Port Adelaide and aflratings.com.au’s top five potential targets for 2017. Under Ken Hinkley Port Adelaide do not have a game plan that is conducive to high team fantasy scores, last season they were ranked 15th averaging 360.9 Disposals per game. The Power registered 400+ Disposals or more in only 2 games (Rank 16) and both were against a struggling Brisbane team that gave up plenty, additionally they did not achieve 325 Disposals in 5 games (Rank 16) which does make them a tough sell for the upcoming 2017 season. 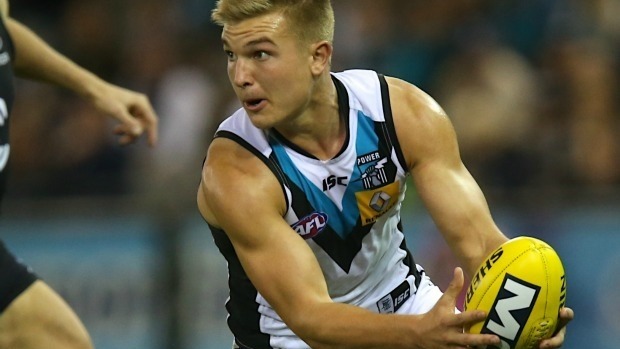 Ollie Wines was the only player to average over 100.0pts in 2016, the Power were ranked 16th in team fantasy points (1526.2) narrowly ahead of Gold Coast with Brisbane ranked last. Wines was clearly the best fantasy option at Port Adelaide in 2016, he averaged 100.6pts and scored 100pts or more at a reasonable 59.1% S/R (Strike Rate). Wines points ceiling was somewhat limited scoring 120pts or more at a low 9.1% S/R, his 2016 season highest score of 124pts came against Adelaide in Round 2 (Ave 118.5 vs Crows in ’16). Wines did finish the year off strongly, he averaged 108.8pts in his final 9 games 8 of which he scored 100pts or more and averaged 112.2pts from his final 5 games. Wines was pretty consistent over the season with a late breakout, entering his 5th season in 2017 he may be ready to take the next step. Gray was very frustrated at being shutdown in Rounds 4 & 5 against GWS & Geelong respectively in 2016 averaging just 61.0pts, the heavy losses meant he was unable to produce for fantasy coaches. Again in another heavy loss this time in Round 20 against Sydney Gray delivered just 40pts, removing those 3 scores he averaged 105.8pts which is a positive especially if there is a DPP to be considered at any stage in 2017. Gray also injured his hamstring at training prior to Round 6 and subsequently missed 3 games, he returned to play out the remaining 14 games in the season to average 99.1pts. If Port Adelaide can produce a winning 2017 then Gray’s average of 107.4pts does come in to play, maybe not worth the start at Round 1 but certainly a consideration if a FWD DPP is applied. Sam Gray is building a nice resume of fantasy scores after averaging 87.1pts in 2016, after being a popular selection to begin last season he disappointed many coaches averaging just 78.6pts in his first 5 games which included an opening 118pts against St Kilda. Those coaches that stayed patient with Gray were rewarded with his 91.4 average in his final 11 games after missing 3 games between Rounds 7-9, he scored 100pts or more at a very low 23.5% S/R. 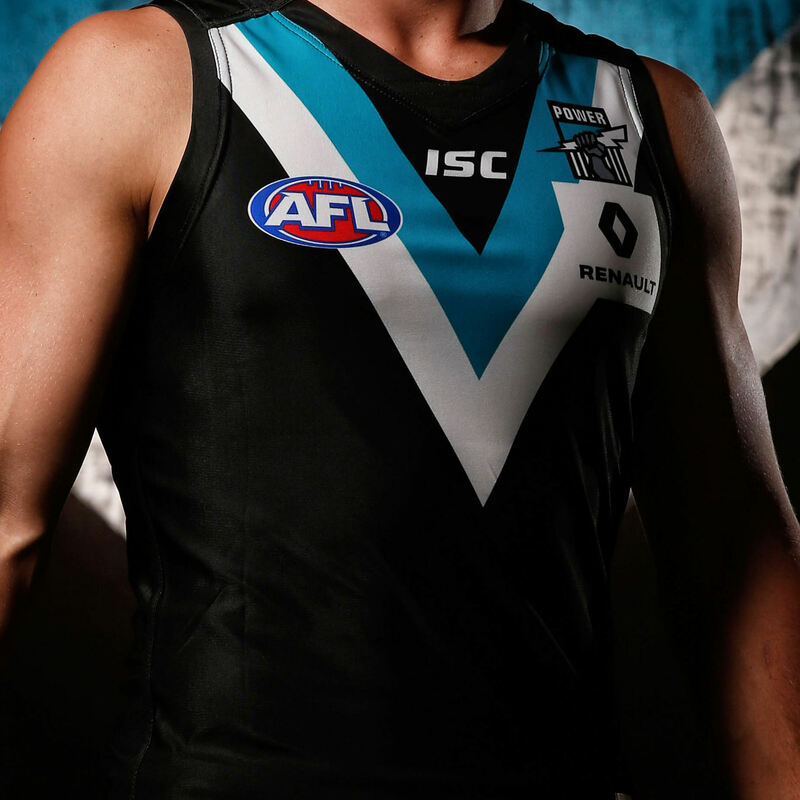 Keep an eye out for Gray in pre-season games, entering his 4th year in the AFL Ken Hinkley may utilise him in fantasy friendly positions that could provide a little more upside in his average. Ryder’s fantasy game in 2017 likely revolves around the Ruck setup at Port Adelaide, after missing 2016 via suspension he starts next season at a tempting price with FWD/RUCK DPP eligibility. 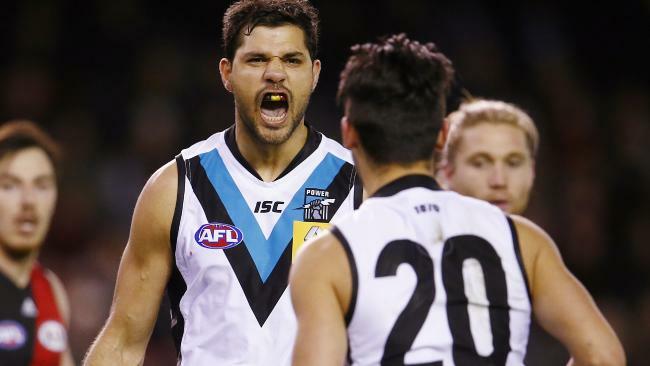 Ryder averaged 76.5pts in his first year at Port Adelaide in 2015, he averaged 73.2pts when Matthew Lobbe played but that increased to 85.0pts when Lobbe didn’t play. If Ken Hinkley openly commits to playing only 1 Ruck during the season then Ryder is a worth considering, Ryder did average 90.3pts in 2012 averaging 21.9 Hit Outs and 88.7pts in 2014 averaging 26.1 Hit Outs at the Bombers. A very controversial selection in Aaron Young here, you might remember him as the guy who out of nowhere was on the receiving end many times of a Power fast break with no opponent kicking goals last season. With the perceived limited options in the forward line to begin the 2017 fantasy season and depending on your strategy Young is worth at least a look, after kicking 37 Goals in 2016 Hinkley will likely use him in a similar role next season and with Wingard getting most of the attention Young again could put up a reasonable fantasy average. Young averaged 75.2pts in 2016 up from 45.7pts in 2015, he averaged 79.6pts with Wingard playing and just 61.0pts when Wingard was injured in Round 21 or not playing during the season. There is the potential for a little more upside in Young in 2017, a successful Port Adelaide season may be very beneficial for him (Ave 84.6 in ’16 PA wins). Hamish ‘Temptress’ Hartlett is potentially priced 12-14 points on what he is capable of. Sizable risk for a player that could be a backline keeper – though is certainly on plenty of ‘never again’ lists. 2016 was his lowest fantasy average since his debut year back in 09′. Will at the very least make you some cash.